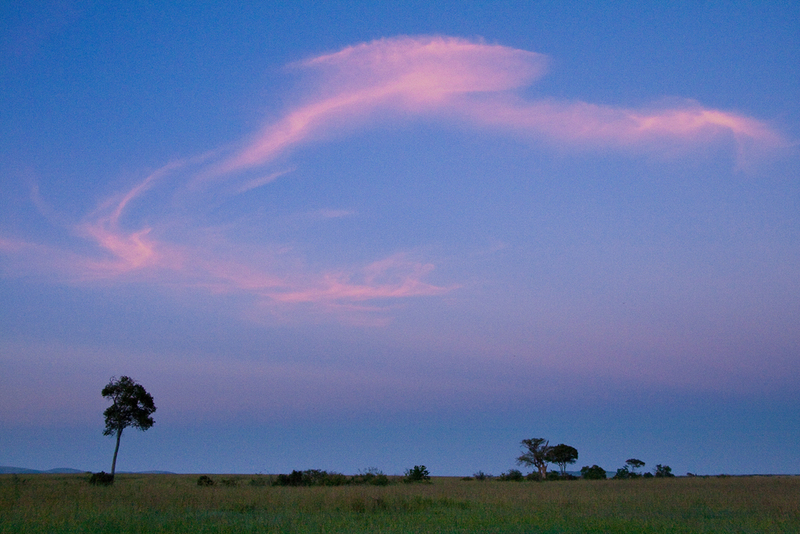 One of my safari mates – Sabrina Henry – suggested a “lone tree challenge” in her blog. 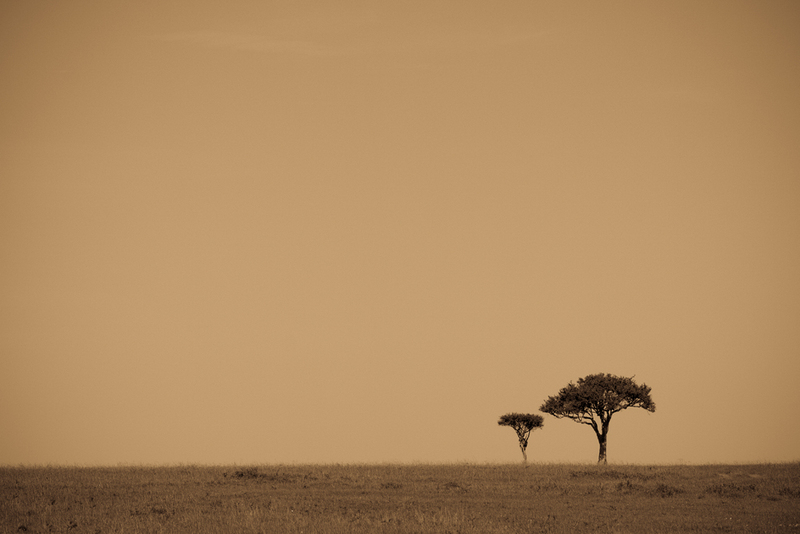 We certainly saw a lot of lone trees during our safari and obviously you try to capture them in a new way each time. So I decided to share a few images that, even so they have the common denominator “lone tree” (or almost lone), are still very different from each other. In this first image I liked the relationship of the larger and the smaller tree, how they were spaced. By turning it into a sepia image it brings even more attention to their shape and the isolation. The other option was to find an interesting sky and I had a couple of opportunities. One was early in the morning, just before we were ready to board the hot air balloon. This beautiful pink cloud formed in the sky above the tree. 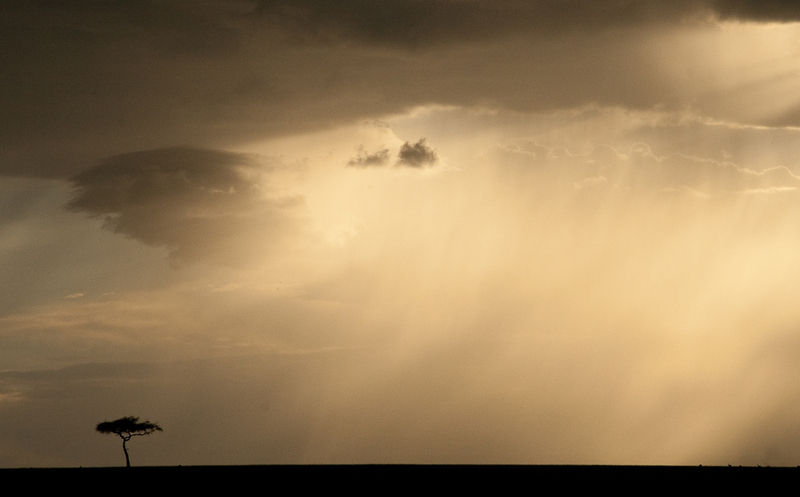 On our last game drive in the Masai Mara a storm was brewing on the horizon. Everyone in the van seemed to be focused on a lion cub in the brush, which had no interest whatsoever in getting photographed. So I turned around to see what else there might be and I noticed the storm approaching. Quite a dramatic sky. Always check what is going on behind you! Really like the sepia one. Great feeling of isolation. Came here as I follow Sabrina’s blog too. The bottom one, the one tree alone as the storm approaches, is my favourite of these three. Very dramatic and makes the tree feel so small in the face of the coming storm. It really stands out, it’s a great shot. Beate, I have to agree with Chris. That last image is a stunner! Thank you for your comments everyone. I really appreciate it.